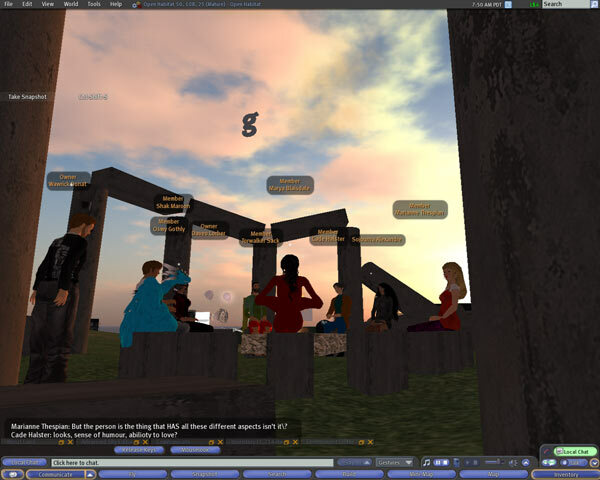 What happens when you take 6 online philosophy students with and average age of about 50* and attempt to run a discussion session on ‘identity’ in Second Life after only two short orientation sessions that not everyone could attend? Well against my expectations they actually spend the majority of the time ‘really doing philosophy’ (to quote the tutor) and then 4 of them arrange to continue the discussions on a regular basis after the official ‘Open Habitat’ project pilot has finished. General enthusiasm all round and many constructive comments on how future sessions could be organised and formatted. So the initial question I ask myself is not “why did this work?” but “why did I think it wasn’t going to work?” The answer can probably contains an number of things that I didn’t consider until it was clear that the sessions were going ok. The majority of the participants were experienced philosophers. They did not have to grapple with the environment AND the subject. Once they had learnt how to text chat, move and sit down (an activity they all seemed to enjoy) the rest was home territory. The tutor involved was enthusiastic, had experience of teaching online distant students via a VLE and had a clear understanding that Second Life was going to be different and required a new approach. 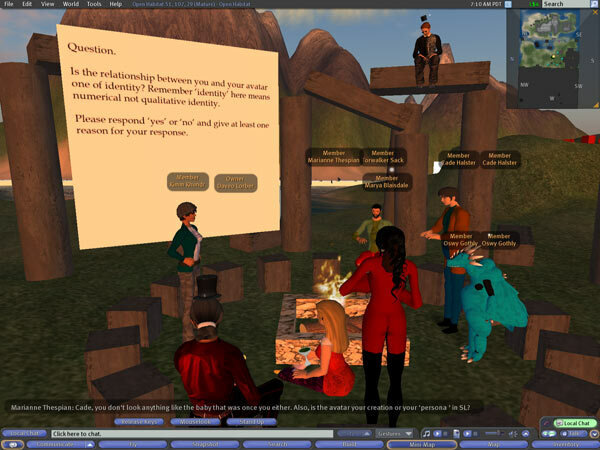 I was on hand through the sessions to IM anyone in difficulties and more importantly I was in the same RL room as the tutor who was also new to Second Life. We were flexible with the teaching format and adjusted activities to fit the flow of the discussion and the speed of response from the students. The participants who signed up for the pilot self selected as those willing to investigate a possible new format. This was not a mandatory part of a course. In other words they were open to a new experience. One of the most successful aspects of the sessions was breaking into small groups. We had placed simple breakout areas within view of each other but just out of the 20 meter range of local chat to avoid cross talk. The tutor could wander between groups much in the same way she would in RL. It was a format that the participants could relate to and it utilised the socio-spatial nature of the environment. The ‘red’ group with the ‘blue’ group in the background. Another interesting technique was circulating a transcript of the chat after the session with annotations from the tutor. I could see this working very well for a rolling discussion over a number of sessions. It wasn’t all plain sailing, some of the participants found the flow of the text chat too fast and too ‘bitty’. By the time they had formulated their thoughts things had moved on and a paragraph of text in the flow of a text chat can appear self indulgent. Of course this is a problem inherent in text chats as a format rather than an SL specific issue. The other major challenge seems to be facing in the right direction when sitting down or, at one point, sitting in a seat that has not already been taken. We now have a lot of data to sift through and many more questions to answer but my initial reaction is that this could become a very effective part of a distance programme blended between VLE and SL. The SL part providing a social underpinning to students who never get the chance to meet face-to-face. As to ‘technological barriers’ and ‘SL pain barriers’ it’s true to say that one of the perspective participants simply could not get into SL at all (a victim of SL graphics card brutality). However, with a little hand-holding the participants who could get in didn’t have too much trouble using the environment to philosophise and did not seem to get tied down by the platform as a technology. *This is not meant as an ageist comment as I think the Prensky-esque notions of the digital native generation are a misnomer (by that I mean “completely wrong”). My point is that these participants are not ‘high tech’ nor are they ‘tech geeks’. They will only use a technology if it aids them in moving their learning forwards.